The Smithfield buyout is not yet a done deal. It must first be approved by the Committee on Foreign Investment in the United States. Whitey (I'm one) is sucking off the system (I'm not) more than anyone, and China is not the problem. This eternal utopian dream some Americans have of staying on top of the world is over. Mentally prepare yourself to melt into the global system. It is the plan of the Big Club, of which, we are not members. Here is a crisis. Are people getting active to do something about it? Nope.Put the blame where it belongs. America is rotting from within after decades of failed policies and inaction by the citzens. Patriots are now labeled domestic terrorists, movements just stir things temporarily, so forget about getting anything done, anything short of an all-out revolution. Try to enjoy your few days on the earth. We are not special. Ok Armour and Farmland....two brands I will NOT be purchasing. Considering China's standards in food processing...NO THANK YOU! Avian Bird Flu – not sure what they did with all the chicken. There's a recall of all chicken due to strange antibiotics in Dog's treats. Milk tainted with melamine, twice, and now they buy up Pork farms. 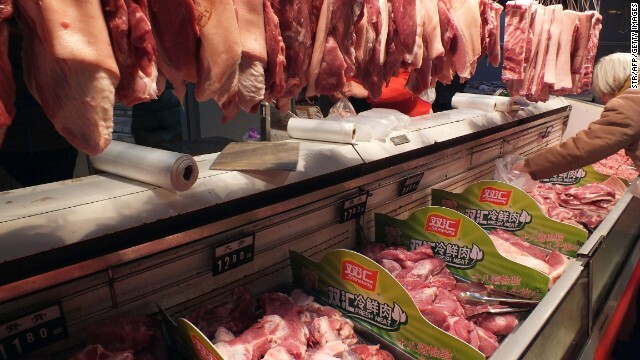 Investment for the processing of pork is a sound business transaction since it provides China an opportunity to produce and process pork at much lower prices than cattle or other animals that need substantial grazing land which China does not have or cannot afford. China's present level of domestic food production may not be adequate enough to support the growing needs of the population and therefore overseas investment in agriculture and animal husbandry is a economic necessity to sustain domestic consumption, future growth and during times of natural disasters. I don't see how this helps the US at all, in fact it probably means more pork going overseas and driving up costs of pork here in the US. What a bunch of sellouts! Greed is the downfall of this country ! We want a car that will get 50mpg and we want to pay $10,000 for it. We do not care where it came from or who assembled it. We don't care that our neighbor is on unemployment, that's his problem. Our leaders stumble all over each other trying to blame each other for the country's problems, no one is standing up and saying "I've got a plan" ! I've got a plan to bring jobs home, to quit paying millions in aid to other countries while we sit weakened, to quit squandering our tax dollars here, to fix the IRS with a SIMPLE tax plan we all understand, tand o fix our medical issues, no, our leaders have a plan to throw mud at each other while the world watches us fade away. Loss of economic control was also the red herring thrown out when the Japanese went on a Real Estate buying spree in the 80's. How did that work out? Right on brother. We better get our heads out of our asses. America is being taken over by Asians and Hispanics and we have our government and the corporations to thank for that. They come here and breed,leaving the whites to be the minority. They are constantly sucking up our tax dollars on programs such as welfare, Medical and education,destroying the middle class and turning us into the minority.if we don't take back our government and we allow this to continue then we have no one else to blame.the government, corporations and bleeding heart liberals label us as biggots and racists every time someone tries to speak up. It is time to band together and change this once great country known as America. Hispanic is not a race. There are white hispanics. And hispanic is not a synonym for latin. Stop using these names incorrectly. So you're implying Asians and Hispanics aren't really Americans and they're ruining this country by sucking the government dry and bankrupting the country. That's quite insulting to those who have come into this country by legal means, and may I mention that as a whole, Asians have the highest median household income in America, which might imply we're contributing more to this country per capita than whites are. Take this country from us? Good luck with that. Greed will be the downfall of America. You are not greedy? You are an angel? this is not left vs right, GOP vs Dems, Socialism vs liberty. This is war against White people.